Pokemon Figure Monster Collection Promotion will starts by Tomy from the end of Februrary 2011. 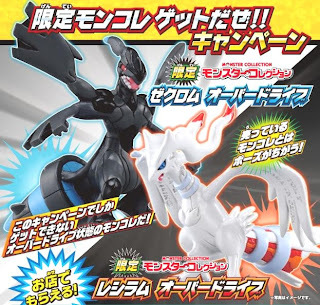 When buying 5 pcs Tomy Pokemon figures (MC or MC+ series), a Zekrom or Reshiram overdriver limited MC (new pose) give away at the store untill out of limited figure stock. Looks cool, Pokemon typically comes up with neat promos like this.